Place onions and mushrooms in 3 1/2- to 4-quart slow cooker. Top with beef roast. Pour broth over beef. Sprinkle soup mix (dry) over beef. Remove beef from cooker; place on cutting board. Cut beef into 1/4-inch slices. To serve, fill rolls with beef. 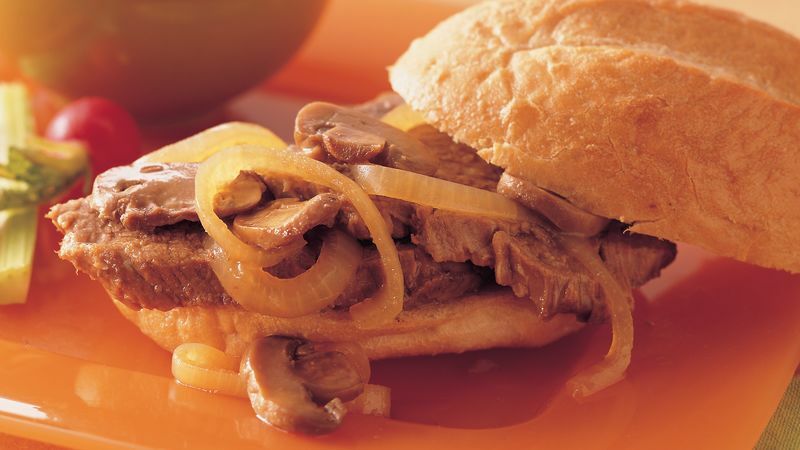 Remove onions and mushrooms from cooker, using slotted spoon, and place on beef. Serve juices in cooker in small individual bowls for dipping if desired. What are your favorite buns or rolls? Dark and crusty or topped with sesame seeds - make it your fun choice.